In Paris, we have a decision to make each year: Nordmann or Epicéa? A Nordmann fir stays green and doesn't shed even though it's been chopped at the trunk and nailed to a half-log. Its branches are a bit droopier, with more gaps. Epicéa perfumes the apartment with that pine smell but will shed unless watered in its pot. It tends to be fatter, bunchier, and with fewer bald spots. Unfortunately, we can't gauge that for ourselves because the trees are all bundled up in netting at the florists where they are sold in Paris. Both species have a single long branch sticking up at the top for the measurement. It's cheating of course, like counting the radio tower on top of the Empire State Building for its total height, and it drives me crazy. Let's face it, the full top half meter of each tree is not actually tree at all. The first year, our tree is 1.75-2m tall, the second year 1.5-1.75. But that's including the antenna top. The French who come visit us marvel at how huge our tree is -- and how much like something you'd see in a hotel lobby. We don't think so, but then we're used to our American tree, which would be a) full to the top, b) 8-9 feet (so 2.5-3m), and c) sitting in our big American living room under high Victorian era ceilings. So we feel like our Parisian trees are so modest, they're approaching Charlie Brown Christmas territory. It's all a matter of perspective. Weighing the pros and cons, we opt for the Epicéa for the first year we live here. It looks and smells beautiful, but the problem is that it is so prickly, it is virtually impossibly to handle. It's hard to even put the ornaments on. This is the pine that lets you know why the leaves are called "needles." Watering it turns out to be like trying to pet a porcupine, so much so that I dread the aftermath. Anthony comments that he doesn't know why I dread it, since the hauling out will clearly fall to him. But I also know that I will have to a) help out and b) suffer through him being a martyr. And sure, enough, he does get crucified by a very, very large crown of thorns, and tells me in no uncertain terms, "Next year, a Nordmann." Nordmanns, which we get the second year, can't be watered, so by the time we haul it out, the needles are again falling off. But they are not unbearably prickly to sweep, vacuum, and haul. This year's tree, our third in this apartment, is again a Nordmann -- 2-2.5m. We try to choose one with a small antenna. I miss the smell of the Epicéa, but yes, I realize I'm not the one hugging it for half a kilometer to the dumping station. This cheese is, frankly, usually called Fleur du Maquis or Brin d'Amour, but I buy it as a Brin du Maquis, so that's how I'm going to label it. It's a Corsican cheese covered with the herbs rosemary and savory, which complement the crushed juniper berries and tiny bird's eye chili peppers. These peppers give a burst of texture and flavor but not so much kick -- the French not being exactly known for their tolerance of anything hot and spicy. 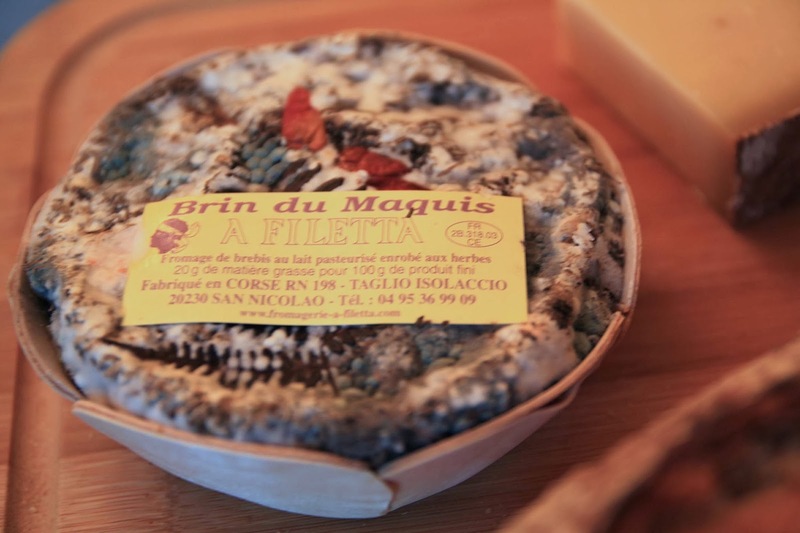 It's an artisan cheese invented in 1953 in the Bastia region of Corsica. 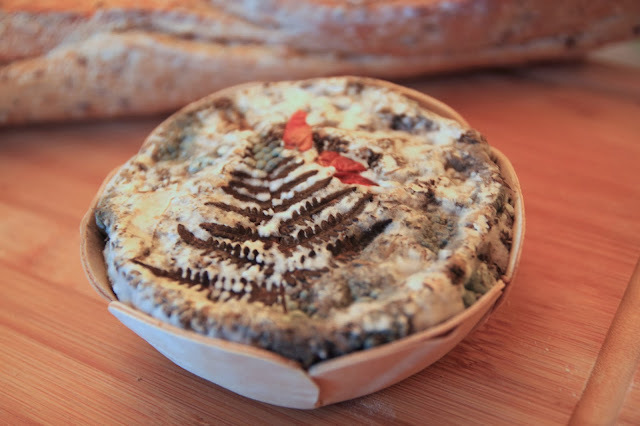 This soft, small cheese is made from raw or pasteurized sheep milk aged for 1-3 months, and you can actually taste the scrubland where the sheep graze. It's earthy, creamy, and both sweet and savory: sweet from the mellow creamy interior and savory from the herby exterior. Older versions taste both more sheepy and salty, as the flavors intensify over time. One French cheese site advises you to serve yourself this cheese last, no matter what else is on the cheese platter. 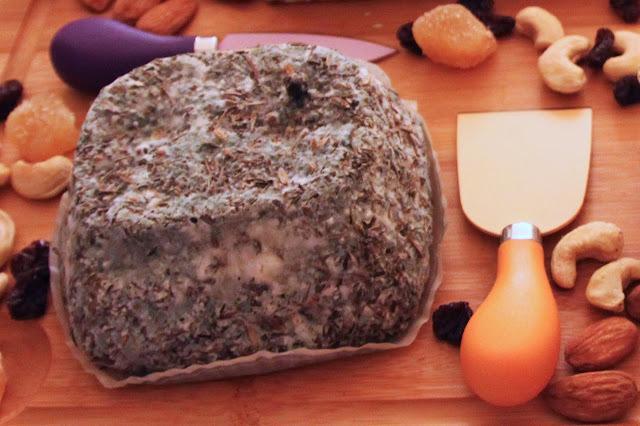 I presume this is for two reasons: The herbs give it a bold enough flavor that you'll want to work your way up from the mildest to strongest cheeses to avoid overwhelming your taste buds. And, also, because it's so delicious, you'll want to end with it! 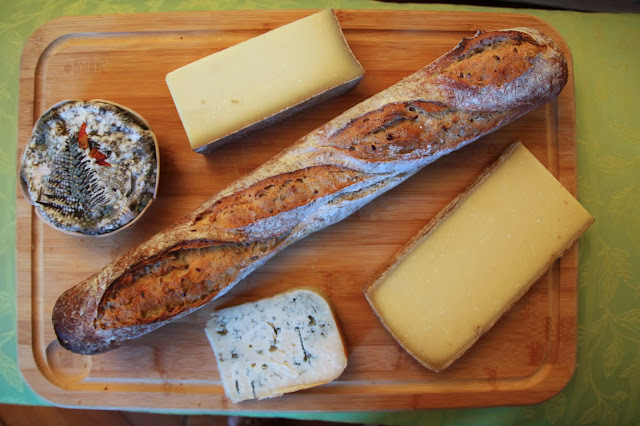 The name of the cheese "Brin du Maquis" means "strand of (Corsican) scrub" (Interesting sidenote: not only does Maquis mean "Corsican scrub", it's also the term used for the Corsican resistance movement against the Nazis and Vichy government during WWII and, in honor of that, a 24th century resistance movement in the Star Trek series). Scrub strands certainly sounds prickly. And, indeed, a Brin d'Amour my friend brings over looks far pricklier than (and, frankly, nothing at all like) the Brin du Maquis I buy. The usual names, Brin d'Amour (Strands of Love), and Fleur du Maquis (Flower of the Scrubland) are equally poetic, if somewhat less prickly sounding. The color of the mold is said to vary between red and green. How appropriate for the holidays. But more to the point, the decoration of the scrubland leaf on the cheese I buy looks just like a Christmas tree. It's even got the little red ornaments on it.